Toots Shor famously said, 'Any crum-bum what can’t get plastered by midnight just ain’t tryin’. The return of the AMC show "Mad Men" provides more opportunities to re-visit the early 1960s world of advertising on Madison Avenue in New York and to re-live a smoke-filled, martini-soaked era that sure was fun while it lasted. One of show's favorite settings is a re-creation of Toots Shor's, where food and strong drink was served up with a heaping side of insults and put-downs. 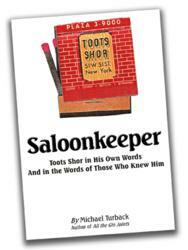 A just-published book, "Saloonkeeper: Toots Shor in His Own Words and in the Words of Those Who Knew Him" History Company Books, $12.95) offers a real-life portrait of the gregarious Mr. Shor and his legendary New York men's club. The 200-page collection of wisdom and wisecracks from Shor and his contemporaries is available at Amazon.com. "Toots Shor famously said, 'Any crum-bum what can’t get plastered by midnight just ain’t tryin’," reports author Michael Turback, whose book goes beyond "Mad Men" for a view of a time when men were men and women were dames, and when getting properly inebriated was a sign of character. Author Michael Turback has published more than a dozen books, most notably "All the Gin Joints," a best-selling guide to original gin-based cocktails developed in progressive American bars.